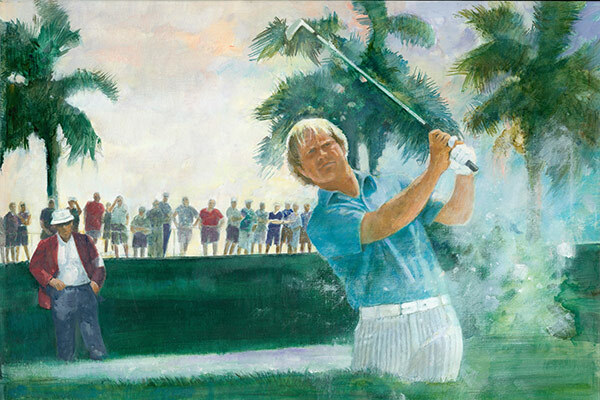 Playing at PGA National Golf Club, Jack Nicklaus felt right at home – literally – and put on a complete display of his mastery. The 1971 PGA Championship was unique for several reasons. For one, it was played in February, rather than in its customary August slot. Second, it was a home game of sorts for Jack Nicklaus, as the venue at PGA National Golf Club was just minutes down the street from his North Palm Beach, Florida, home. The combination worked well for the golden bear. He opened the 1971 PGA Championship with a 69 that impressed his playing partner, 69-year old Gene Sarazen – a man not easily impressed. “I saw a real champion today,” said the man known as the squire. “I never saw such power and he putted magnificently.” A second-round 69 gave Nicklaus a two-stroke lead over Miller Barber and he increased his lead to four with a 70 in windy conditions on Saturday. Nicklaus played a conservative final round, shooting a one-over-par 73, which was good enough to beat Billy Casper (68) by two strokes and 58-year-old Tommy Bolt by three. The victory made him the first player to win all four modern grand slam titles twice. He was just 31.